What would it really be like to live through the sinking of the Titanic or President Kennedy’s assassination? A new app tries to answer this question through your phone’s push notifications. Timebound, an app created by a team of journalists and developers from Esquire Russia and recently launched on Kickstarter, provides more than just documents and photos to help you understand major world events from the past. 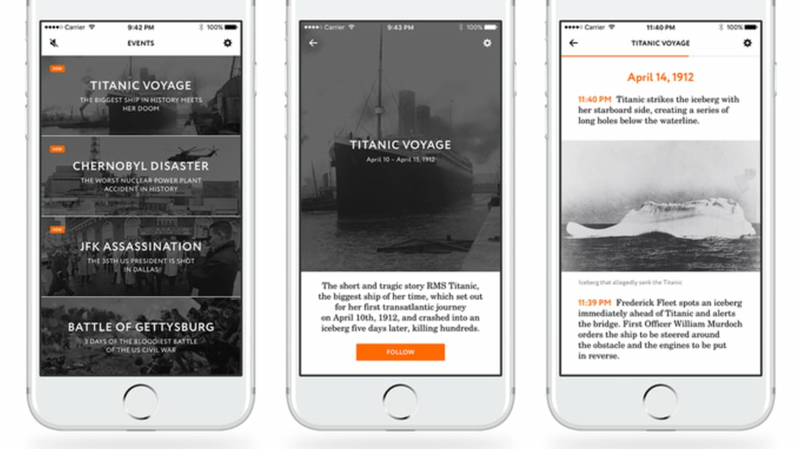 When you subscribe to certain events in the app—like the sinking of the Titanic—Timebound will help you experience it in greater detail. If you choose to track JFK’s assassination in November 1963, the app will send you notifications every few minutes with information about what was happening at that exact moment, from when the presidential motorcade left the Dallas airport to when the priest administered the president’s last rites at the hospital. "Push-notifications are an essential part of Timebound," according to the app’s Kickstarter. "They may come in the middle of the night, during a meal, or while you are commuting to work. History will become a part of your daily life." It’s an intriguing concept. Some events, like the death of JFK, have outsized significance in history, but lasted only a few hours, while others dragged on for years. It’s easy to know that World War II lasted for six years; it’s another to be reminded of how those events unfolded every day for those 2193 days. Timebound is subscription based, and a year’s worth of access runs for $10. When it launches in May, some events will also be free to track, and others will be available for a one-time purchase.